Home Blog Can you Learn Portuguese in 5 Minutes? Can you Learn Portuguese in 5 Minutes? Learning language is always going to be difficult. Given this, however, the advent of the internet and its widening usage does make it a lot easier. A massive amount of online resources are now available to help people learn new languages. This is useful because students no longer need to register for a class and wait for their assigned weekly or bi-weekly classroom instructional time. Now, all of the instructional materials a student may need to learn a language are always available online, whenever it is convenient and as often as the student desires to study. Even in addition to this, most online resources are either free or low cost – thus further reducing the entry requirements for learning a new language. The following paragraphs will provide a run down of how to learn as much Portuguese as possible, while still keeping in mind that it will always take longer than five minutes to learn a new language, regardless of the media in which it is learned. To start, any English word that has the suffix ‘al’ is the same in Portuguese. For example, normal, cultural, international, educational are all the same in both languages. Given this, anyone who speaks English already knows some Portuguese. So, if you have been wondering how to learn Portuguese in 5 minutes, please realise that you already know some. This single rule includes more than 500 words, which is not a bad start. Another suffix rule to quickly learn is ‘ency’ to ‘encia.’ Specifically, any English word that ends in ‘ency,’ such as frequency, congruency, frequency, and transparency, respectively become frequencia, congruencia, frequencia, and transparencia in Portuguese. This adds 100 more words to your Portuguese library of words, for a total of 600 already. More suffix rules can be used to add even more rules to a student’s repertoire. English words that end in the suffix ‘tion’ can also be quickly converted to Portuguese words, as ‘tion’ is replaced with ‘cao.’ In practice, this turns words like nation, action, activation, construction become nacao, acao, activacao, and construcao in Portuguese. This adds a further 100 Portuguese words. English words that end in the ‘ily’ suffix, end in the ‘mente’ suffix in Portuguese. For instance, logically, metaphorically, morally, and originally, become logicamente, metaphoricamente, moralmente, and originalmente respectively. This adds a further 100 Portuguese words, adding 800 new Portuguese words. The final suffix rule for learning Portuguese is for English words ending in ‘ty.’ English words that end in ‘ty’ end in ‘dade’ in Portuguese. For example, prosperity, activity, community, and creativity become prosperidade, actividade, communidade, and creatividade in Portuguese, respectively. This final rule adds another 100 words of Portuguese that someone can learn almost instantly, for a grand total of 900 words in 5 minutes. To recap all of these suffix words, remember the following notes. English words that end in ‘al’ in English are spelled exactly the same in Portuguese. National, for example, is the same in both English and Portuguese. Words ending in ‘ency’ in English end up ending in ‘encia’ in Portuguese. Fluency therefore becomes frequencia in Portuguese. Words that end in ‘tion’ in English, end in ‘cao’ in Portuguese. Therefore, the word action because acao. Next, words with the English suffix of ‘ily’ take on the suffix ‘mente’ in Portuguese. An example of this is originally, which in Portuguese is originalmente. Finally, English words with the suffix ‘ity’ change to ‘dade’ when translated to Portuguese. A final example is the word prosperity in English becomes prosperidade in Portuguese. While learning these 900 words in Portuguese is helpful, it leaves a lot to be desired. Most obviously, you can read and write all of these new words, but there is no resource included here that teaches the new pronunciation of said words. Given this, it does not aid in learning how to speak a new language, only how to read and write it, which albeit is still good and helpful. Given this, however, the advent of the internet and its widening usage does make it a lot easier. A massive amount of online resources are now available to help people learn new languages. This is useful because students no longer need to register for a class and wait for their assigned weekly or bi-weekly classroom instructional time. Now, all of the instructional materials a student may need to learn a language are always available online, whenever it is convenient and as often as the student desires to study. Even in addition to this, most online resources are either free or low cost – thus further reducing the entry requirements for learning a new language. 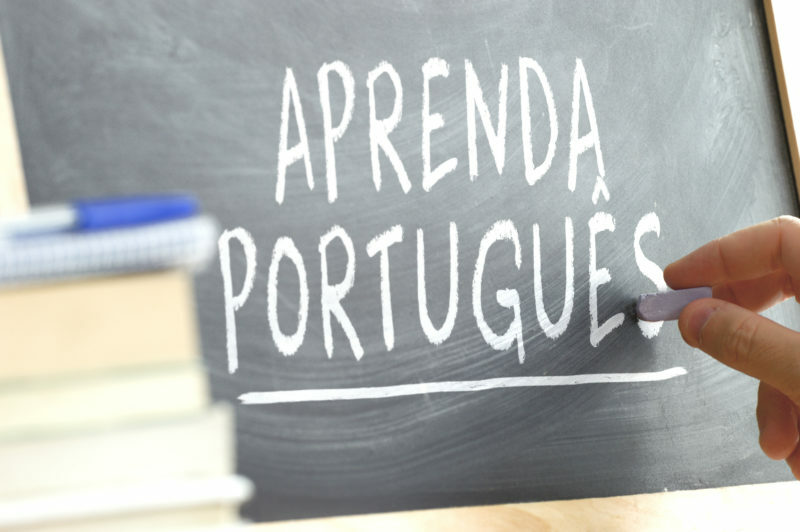 The following paragraphs will provide a run down of how to learn as much Portuguese as possible, while still keeping in mind that it will always take longer than five minutes to learn a new language, regardless of the media in which it is learned. For example, normal, cultural, international, educational are all the same in both languages. Given this, anyone who speaks English already knows some Portuguese. So, if you have been wondering how to learn Portuguese in 5 minutes, please realise that you already know some. This single rule includes more than 500 words, which is not a bad start. Another suffix rule to quickly learn is ‘ency’ to ‘encia.’ Specifically, any English word that ends in ‘ency,’ such as frequency, congruency, frequency, and transparency, respectively become frequencia, congruencia, frequencia, and transparencia in Portuguese. This adds 100 more words to your Portuguese library of words, for a total of 600 already.